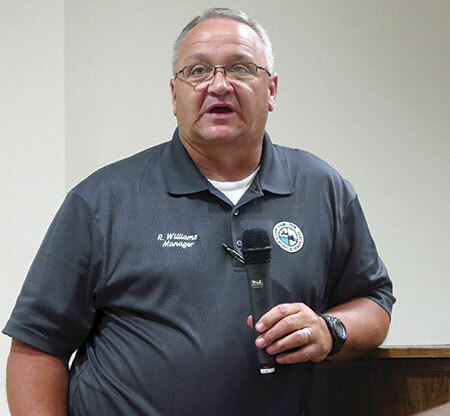 Hamilton Water Superintendent Rodney Williams gave a public address at a Hamilton City Council meeting held on Tuesday, Sept. 5, concerning a unforeseeable string of events which resulted in some of Hamilton’s being left with little-to-no water during Labor Day weekend, Aug. 31-Sept. 3. HAMILTON - Hamilton residents experienced issues with their water service during Labor Day weekend. Hamilton Mayor Bob Page made a public address at the Hamilton City Council meeting held on Tuesday, Sept. 4, that due to a “perfect storm” of events with the Hamilton Water Department’s water purification system, many residents began to experience little-to-no water pressure at their homes and businesses. Some businesses had to close for a day, while others were not unable to serve beverages. According to Hamilton Water Department Superintendent Rodney Williams, on Friday evening, Aug. 31, one of the city’s two one-million-gallon tanks at the city’s water treatment plant was drained to install a new vacuum system.